Today is my turn to share a project over on the ShimmerzPaints.com blog. This month we were asked to pick a color from the Shimmerz range of products to showcase and create a winter themed project. So here is what I created. My finished card size is 5 x 7. The base is white cardstock. In fact all of the pieces started out as white cardstock. The background mat is white watercolor paper. I cut it at 4.5 x 6.5. 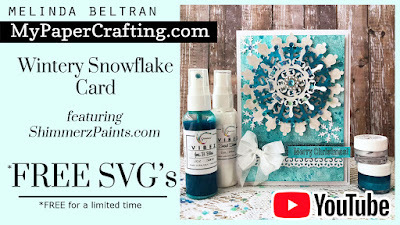 I used the Jenni B Bleu and Snow Storm Vibez Sprays to create my background. I did also use a touch of the Peacock’s Plume Shimmerz paint to add just a bit more depth. Check out my process video! 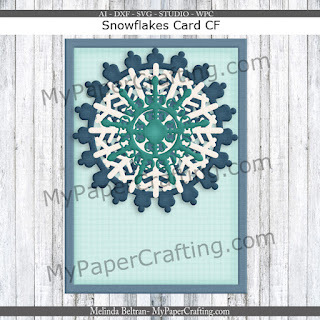 Here’s a closer look at the pretty snowflakes I created. I cut them all out of plain white cardstock. I used my Misty Morning Inklingz to add some shimmer to the bottom and top layers. For the middle layer, I painted that snowflake with some Peacock’s Plume shimmerz paints. 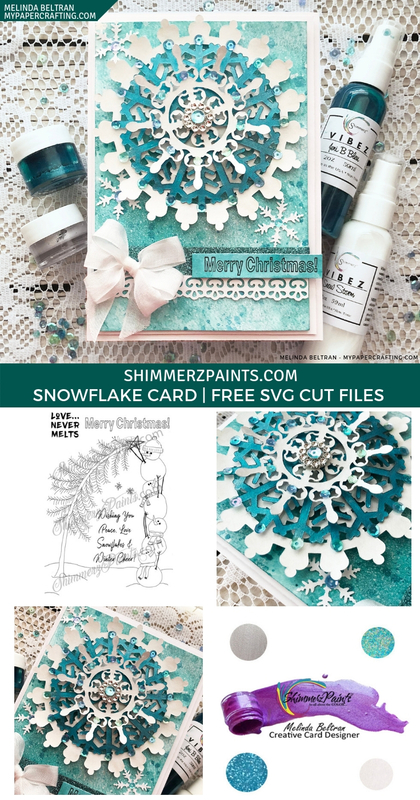 Here’s a closer look at the snowflake layers. I added some foam tape between the layers to give them some lift. I also added some sequins and a little embellishment to the middle. Here’s a closer look at my stamped sentiment. I used the sentiment from their new Love Never Melts Clear Stamp Set. I stamped on some plain white paper and then spritz some more Jenni B Bleu Vibez Spray and again used the smooshing technique to drag and pick up the color. I layered the sentiment onto some sparkly washy tape and a border I punched with one of my Martha Stewart punches. In this shot you can also see one of the little snowflake punches I used. Here’s a closer view of my seam binding bow. You can also see how pretty the background paper is. Here is one last look at my finished project. I love how it turned out. Be sure to head over to the SHIMMERZ PAINTS SHOP and pick up some of these beautiful products. They really add such a beautiful finish to your projects. Don't forget to add my name: Melinda Beltran to the comments when you place your order and you will get a freebie! How's that for awesome!!! Free for a limited time, so be sure to scoop it up! 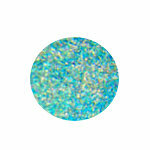 Now all that's left is for your to go pick up a little Shimmerz Paint and you can make your own! Don't forget to mention my name in the comments when you place your order there! 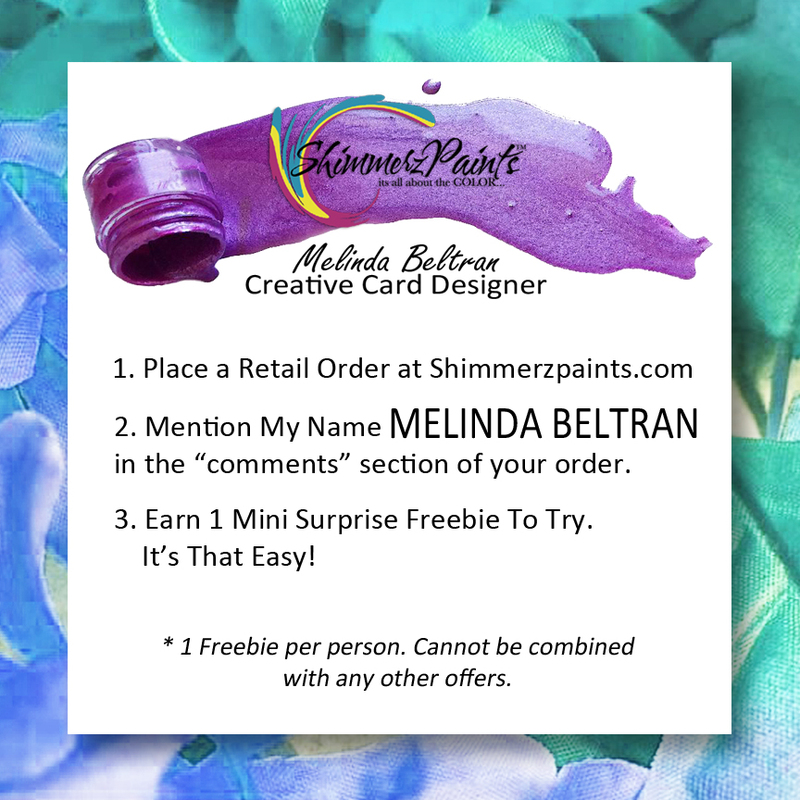 You will get a little freebie to try! Thank you so much for allowing me to share with you. Please leave me a comment and let us know you were here. Don't forget to check back to see what the rest of these amazing designers are working on! Until the next time, you have a wonderfully crafty day!